Full kitchen remodel under 45K. 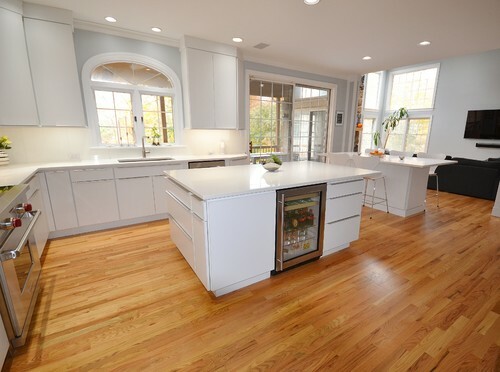 Chester County kitchen & Bath along with our lead carpenter Don Pitt transformed this clients original builders grade kitchen to have a new sleek and sophisticated look. The Fusion Blanc perimeter cabinetry combines to look great with the contrasting black hood and island. The new large Kohler Apron front sink makes cleaning big pots and pans a breeze. Clean glossy Akdo’s tile in a 2 ½ x 10 ½ size set in a subway pattern and changed to a herringbone pattern at the range looks clean and bright and the change in pattern adds interest. 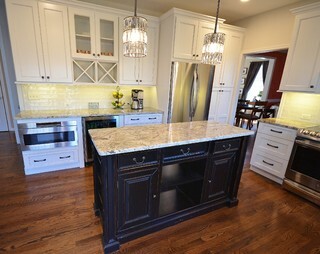 The customer’s light fixture choice for above the island is fantastic; they make the space. All in all a great looking new kitchen for awesome clients.